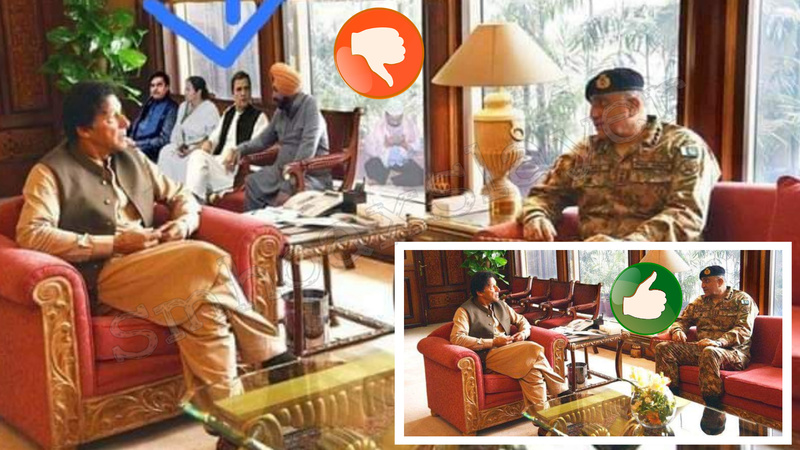 A photo-shopped image is going viral on facebook where it was found that Congress President Rahul Gandhi, chief minister of West Bengal Mamata Banerjee, Punjab’s state minister for tourism and culture Navjot Singh Sidhu and newly joined Congress leader from BJP, Shatrughna Sinha sitting on chairs behind Pakistan Prime Minister ,Imran Khan. In the image it was found that Khan was discussing an issue with Pakistan’s Army General Qamar Javed Bajwa and the leaders are sitting at the back of Mr Khan. On 5th April, 2019 a popular handle on Twitter by the name of @Atheist_Krishna had posted the fake image on his twitter handle which got more than thousand likes and was retweeted. He is known and appreciated by many for his great image editing skills. Given his reputation, many recognized that it’s edited and replied to his tweet calling it fake but when the same editing image reached different platforms like Facebook and WhatsApp people started believing it to be true. SMHoaxSlayer ran a google reverse image search and found that the official twitter handle of Government of Pakistan uploaded the image on April 11, 2019, where Prime Minister Imran Khan and Pakistan’s Army General Qamar Javed Bajwa held a meeting to discuss the security related issues. The official twitter handle of Government of Pakistan has already twitted the photo, with a caption too. ISLAMABAD (Dunya News) – Prime Minister Imran Khan on Thursday met Chief of Army Staff (COAS) General Qamar Javed Bajwa. During the meeting, matters pertaining to situation along the eastern and western borders came under discussion. ← A poor image editing in an ad puts Rahul Gandhi in a soup of mystery. When mainstream media falls for a beautiful photo of India from space claiming Real Diwali Pic ! A set of photos is viral falsely claiming a Hindu Lady was raped by a Muslim on whose hand she tied rakhi on. August 30, 2018 Hoax Slayer Comments Off on A set of photos is viral falsely claiming a Hindu Lady was raped by a Muslim on whose hand she tied rakhi on.